Grilled Lime Herb Fish with Truffle Oil was the recipe we had been wanting to make for dinner, all we had to do find was catch the fish. After hours of fishing, a nice sized pompano volunteered to be the star for our recipe. He was perfect. A firm-fleshed fish we could first season with an Italian herb blend, salt and pepper, toss on the grill, then finish with a light squeeze of fresh lime juice and a sprinkle of truffle oil. Perfectly delicious! Let me tell you about the day Mr.Pompano decided to “take the bait”. We had almost given up hope of seeing a fish at the end of the fishing line. The shore was thick with fog — you couldn’t even see the line. 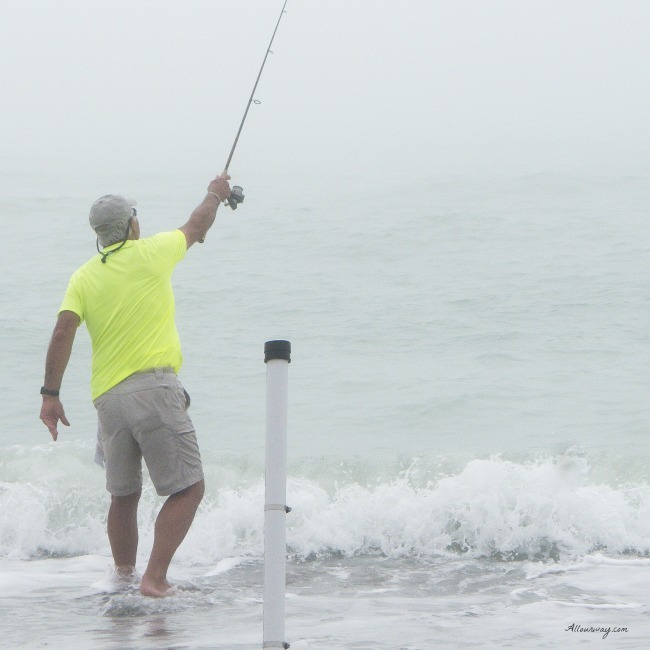 But, all of a sudden, a mighty hungry pompano, determined to grab the shrimp on the hook, gave a strong jerk and tried to make a fast getaway. My Honey didn’t need to see the line to know that there was a strong fish at the end of it. His rod had bent almost in half. The pompano was fighting mad and he wasn’t about to give up his food. Pompano are very strong fish and they don’t cry uncle easily. In the end, my Honey reeled him in to the shore and let him “cool off” over our ice pack in the cooler. It’s best to cook fish as whole as possible. The flesh of the fish is low in collagen –which is the protein — but the skin and bones are loaded with it. When the fish is cooked with the skin and/or bones, the collagen melts into the flesh. Another plus for leaving the fish as whole as possible is that there is less chance of overcooking. When Honey cleaned the pompano for our grilled lime herb fish he left the skin on but removed the bone. He also removed the blood vein that runs through the flesh. The type of fish ideal for grilling is the fatty fish or the moderately fatty fish. A fatty fish, for example, would be pompano, mahi mahi, sardines, wahoo, carp, mackerel. A moderately fatty fish would be tilapia, salmon, swordfish, tuna, trout, walleye. There are a lot more in both groups, so before grilling, I’d make sure it wasn’t a lean fish. A lean fish benefits from a wet-cooking method such as poaching or steaming as we did with our Cod with Mushrooms, Garlic, Vermouth or our Mediterranean Cod. Flounder is another fish that Honey catches often and that is considered a lean fish so we never grill it. 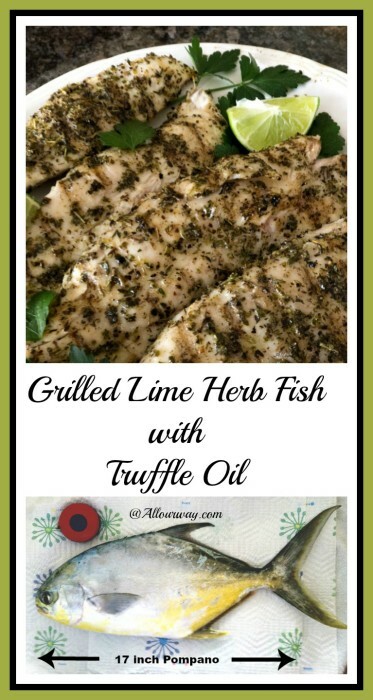 The Grilled Lime Herb Fish with Truffle Oil recipe is ideal for any of the fatty or moderately fatty fish. Tasty yet simple. I know there are a lot of people who don’t care for fish: either because it tastes “fishy” or they only eat the fish stick variety and don’ care to experience fish dishes. The type of fish and the method of preparation is essential for enjoying a delicious fish meal. We added the truffle oil as a finishing touch because we already had some of the dark and light truffle oil . I am really glad we decided to sprinkle it on because it gave the fish a rich earthy taste. If you don’t have any truffle oil, don’t worry the recipe will still be delicious, try adding just a touch of olive oil. 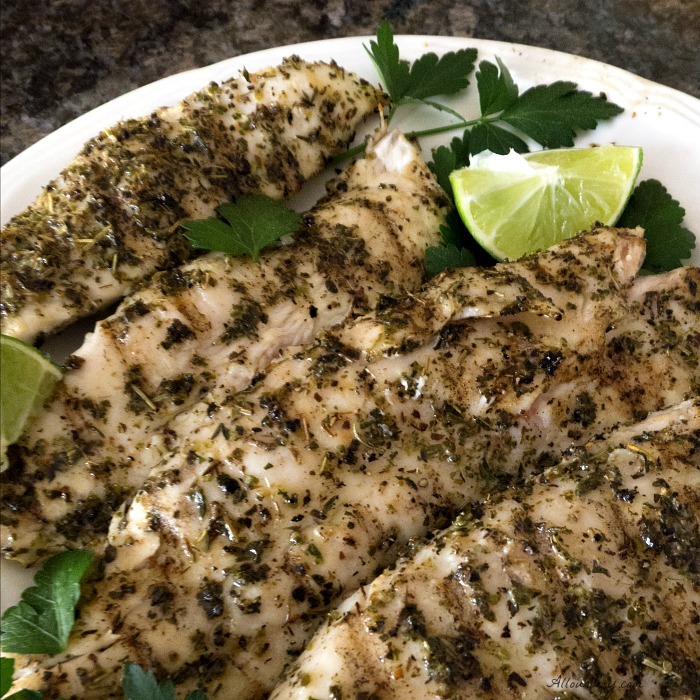 The recipe for Grilled Lime Herb Fish with Truffle Oil takes little time to prepare and grill and it’s healthy for you — believe me, you won’t be disappointed! 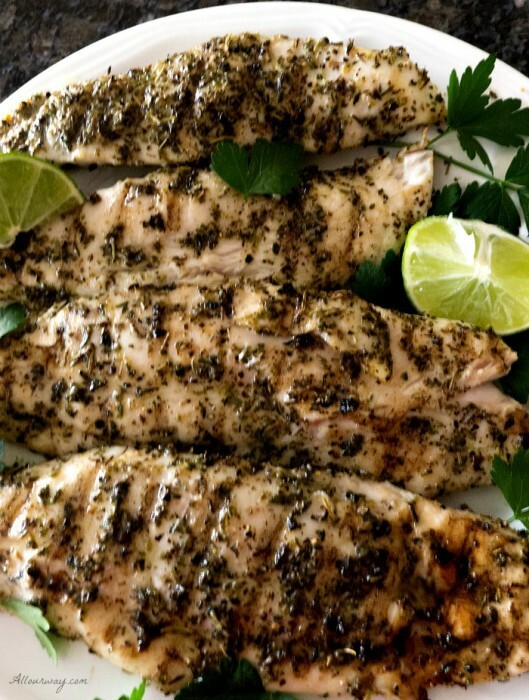 Fish fillets are seasoned with Italian Herbs, salt, pepper, before they are grilled. When they are finished a splash of freshly squeezed lime juice and a light drizzle of truffle oil gives the fish a rich citrus taste. 4 - 8- ounce fillets for grilling be sure you use a fatty or moderately fatty fish -- we used pompano If at all possible leave the skin on. Rub the fillets with vegetable oil and season with salt, pepper and Italian seasoning blend. Grill the fillets skin-side up over medium-hot fire for 3 to 4 minutes. Flip them and cook an additional 2 to 3 minutes, until the fish is opaque all the way through. Remove the fillets from the fire, squeeze a half lime over each fillet, drizzle some truffle or olive oil over them and then sprinkle with parsley. Inspired by The Thrill of the Grill: Techniques, Recipes, & Down-Home Barbecue. Fish with italian seasoning is absolutely the best. I always use just little sea salt, olive oil and italian herbs to season my fish dinner. This recipe sounds so good. I love grilled fish… but must say I never tried pompano. 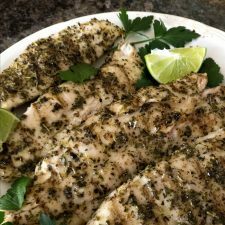 It is so exciting to be able to catch what you eat 🙂 The lime would have added such a great flavor and this recipe is perfect for the summer grilling. Love this recipe! We eat fresh fish all the time and this dish is seasoned beautifully and is so quick and easy to make! The lime really gives the fish a fresh taste. We really enjoy the taste of citrus. This is my ideal summer meal. The fish sounds wonderful and it’s such a simple but delicious coating. I wish I could try this! Hi, Tammy! The lime, herbs and truffle oil will work with other mild fish. We hope you give it a try. Pompano is best fish for making curries an frying them. I like the way they absorb spices and herbs. 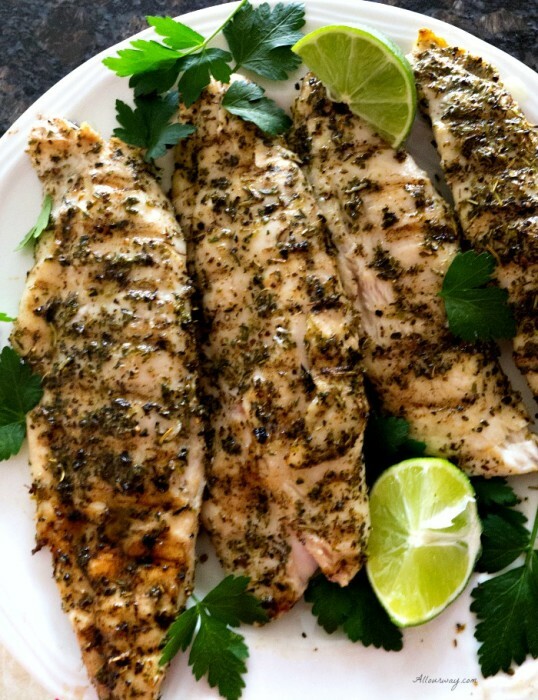 This grilled lime herb fish sounds delicious and great with a bowl of salad. Pompano is a great fish!!! Very versatile and we love it when we can get it fresh from the sea. Thank you, Camilla. It is great on a hot summer evening. Oh, How lucky you are that you get fresh fish. Here it’s expensive and I usually rely on frozen fish. It’s nice but nothing beats fresh. I love grilled fish and I love the idea of using truffle oil. Saving this for later. We are lucky, Veena! You’ll love that touch of lime and truffle oil. Truffle oil is so awesome. Now that BBQ season is finally here….we will be grilling up a storm. Fish is so delicious….and we enjoy it a few times a week. Love the sound of this delicious dinner. Hi, Gloria! The lime and truffle oil really gives the fish that special touch. Loved reading about your husband’s pompano adventure. That grilled fish looks easy to make and very flavorful. Thank you, Pavani! The fish is very easy to make and the taste is fantastic. you have no idea how many times we have tried to catch a pompano. We go surf fishing all the time here and my brother lives in Miami so we try and fish with him once an awhile. We have caught many a flounder never pompano sure looks awesome! Hi, Claudia! Pompano are a pretty wily fish and fast to boot. Keep trying! My mouth was already watering when I read the recipe title but then you’re telling me that this beautiful fish came fresh out of the sea, caught by your honey! That is seriously impressive and makes it even more delicious! I love everything about this post! Makes me want to hop on a plane and get there to go fishing with you guys! We’ve been eating a lot more fish lately…mostly haddock and tilapia, baked with a little Old Bay – so this would be a special treat, for sure! Loving all the flavor and the final swirl of truffle oil! Delicioso, my friend! Have a lovely weekend, Marisa! Annie, come on down — the house we are renting is too big for us!! And Old Bay — I’ve been known to use it quite a bit myself. We buy the HUGE container at either Sam’s or Costco. Have a wonderful weekend with family — I’m sure there will be lots of good food, conversation, and lots of love!! I do love me some pompano. Too bad it’s so hard to find in these parts… ! Marisa, I am inspired. We’re having fish tonight! Great Katrin! Let me know how you fix it 🙂 Tomorrow night is grilled salmon for us. From one italian to another we share the same zest for life. It seem like me you are a romantic at heart and I love to see that in your blog! Your fish recipe is amazing with the truffle oil…Glad i discovered your blog! Ciao Maria! I’m glad you found me too. I am hopelessly romantic and I love happy endings. Perhaps we can become long distance amiche? Buona Pasqua! You are so right Natasha! We have fish at least twice a week and we do enjoy it!! Thank you for commenting!! Oh Linda! How I wish I could have just one delicious truffle to shave a little at a time. There is something about the taste and smell that reminds me of Tuscany. We saw baskets of truffles when we were there. Wish we would have brought some back with us. I believe olive oil will taste great with the fish too. Hope you have a Buona Pasqua with your family! Hi Chiara! It is a funny name isn’t it?? My mamma always liked to say “couscous” she thought it was fun to say. But Pompano is an fatty fish like sardines or mahimahi (dolphinfish).Buona serata e un abbraccio. Living in the desert and always missing the ocean, it made me just a little sad to read about your fish, catch and cook afternoon…but the recipe looks wonderful. Love the photos too. Thanks! I know how you feel, Jeanne. We don’t live near the ocean — we go visit then go back to the Midwest 🙁 But our kids and grandkids live in the Midwest so we don’t like to stay away too long. Gorgeous photos Marisa. Love pompano when I can get it. So glad you posted this recipe because I have truffle oil and I forget to use it. Now I have a new recipe and get to use my truffle oil. Thanks so much. Glad the fishing is good. Thank you Jovina! We were going after more fish today but — niente! !Not even a nibble. 🙂 Start using your truffle oil — we love it. Hugs! I consider myself a picky fish eater, but I’ve forced myself to try different types of fish prepared different ways just to figure out what I do or don’t like instead of just refusing to eat it. I’ve never heard of that type of fish before, where is it native to? Hi Rhiannon! 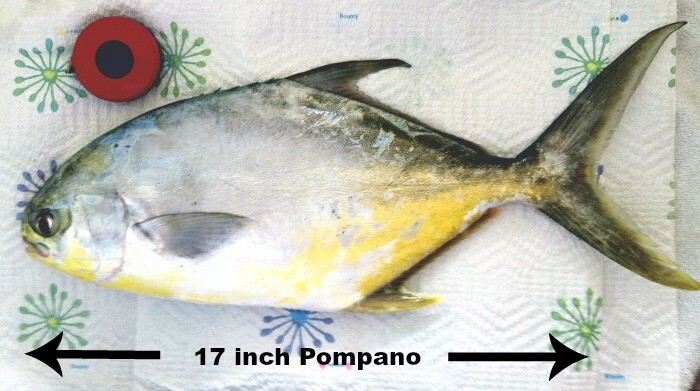 Pompano is native to the East Coast of North America. It runs from New England all the way to South America. This fish has 10+% fat. But you can successfully grill fish with a lower fat content. The fresher the fish the better it will be. There really are a lot of ways to cook fish and have it taste great. We hope you experiment and find a method you like. Our recipe with the Lime marinated mahi mahi is really delicious also. Let me know if you find something you do like. Well – fish *that* fresh! Oh, my! But when bluefish come into season up here, and I can buy from the fishermen, this will be a lovely recipe for them… They grill beautifully! So awesome that you caught this! I used to live in Alaska and understand the excitement of feeling a tug on the end of the line 🙂 This sounds so light and decadent. Yum! It is exciting seeing what’s at the end of the line. That is the nice part when you fish the seas versus the lakes. Alaska?? Wow! I bet you had some fantastic fish!! I love fish (though don’t catch my own!) and this recipe looks amazing. 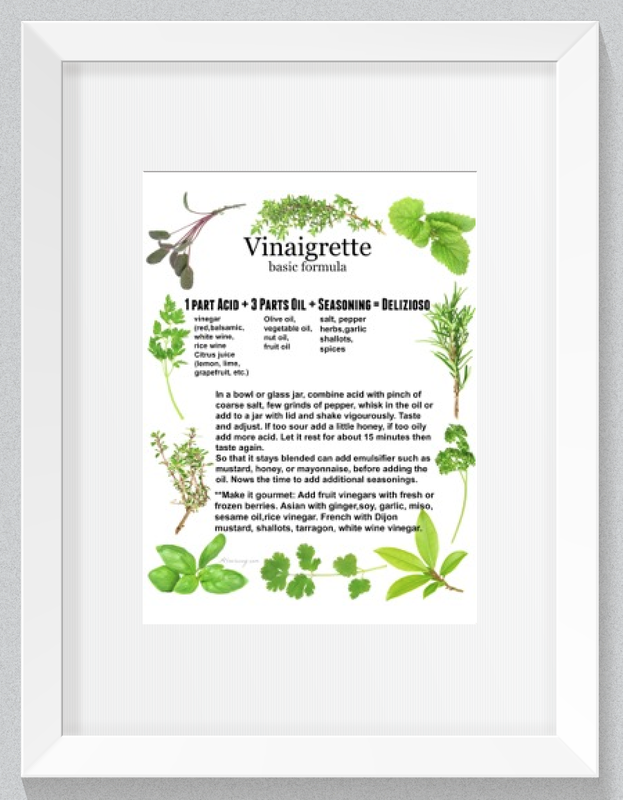 Really like the lime – herb mix, and the truffle oil is truly icing on the cake! I am so glad you like fish — we do too — as you can tell by the recipes. I am glad we used the white truffle oil it added a special element to the dish but olive oil would be fine too. Wow! I love that you caught the fish yourself. Very impressive!!! I sometimes go fishing on holiday but maybe only once or twice in the summer. Would love to do it more. This is a fantastic recipe for making the most of fresh fish.